The Bulk copy program aka bcp is the console application used to export and import data from text files to SQL Server or vice versa. It is very popular because it is fast and easy to download. To export data from a SQL Server table or view to a file, you can use the bcp command. The -c argument is used to perform operations using a character type. -T is used to connect using a Trusted connection (Windows Authentication). -S is used to specify the SQL Server name. You will receive the number of rows copied, the network packet size and the speed to copy the rows per second. PowerShell is a powerful tool to automate tasks using scripts and the command line. You can also run bcp using PowerShell, which is included with Windows and it can be also installed on Linux and Mac. $psCommand = "bcp $($db).$($schema).$($table) out $path -T -c"
It is not a common practice to run bcp on SSIS because SSIS contains tasks to import and export data. You can use the Data Flow task to create customized tasks or maybe use the Bulk Insert task to import data to SQL Server. However, there are some scenarios where you can invoke bcp in SSIS. For example, if you already have some command lines in bcp and you just want to invoke them. Another case is when you are adept at the command line and you already have some batch files ready and you just want to invoke them. Open the SSDT and create a New Project. If you are good using the command line, it is common to use SSIS to invoke a batch file that includes several commands and the bcp file. In this new example, we will export data from a SQL Server table to a file including the current date. The first line will set the file name in a variable named var, including the current date with the extension bcp. For example, if today is November 6, the file name of the exported data will be batfileexport20170611.bcp. In arguments, we will use /c bcpimport.bat to invoke the bat file. Bcp is a powerful tool to import and export data from SQL Server tables to files or vice versa. It is fast, it is also a simple tool that can be easily downloaded. It is possible to export T-SQL queries to a file using bcp. SSIS is another alternative that can be used if you need more customized and sophisticated solutions. We also learned to invoke bcp in PowerShell. To do that we stored parameters in PowerShell and then we used the Invoke-Expression cmdlet. Finally, we learned how to invoke bcp in SSIS. As we explained, it is not a common practice to invoked bcp in SSIS, but it is possible to do it using the Execute Process Task. However, it is common to invoke .bat files in SSIS and they can contain calls to the bcp. 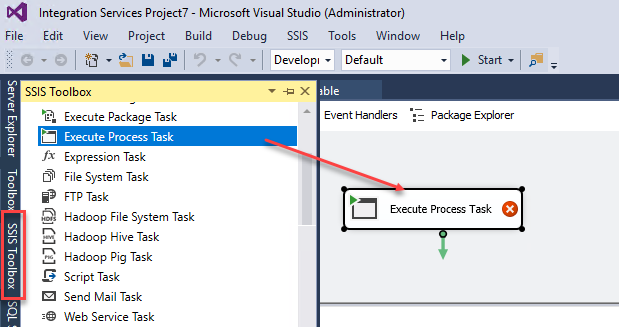 We learned how to use the SSIS Execute Process task to invoke a .bat file.